Lodge Cottage, a 200-year-old house in the heart of Comberford village and beside Comberford church, has been placed on the market in the past week through the estate agents and surveyors, Smiths of Victoria Road, Tamworth. The Bowler family lived in Lodge Cottage, and it later was the home of the Bury family. When I first visited Comberford in 1969 and 1970 in search of details of the family history and following in the footsteps of my great-grandfather, Hilary Bury of Lodge Cottage was encouraging and shared many stories in local lore. This detached cottage was placed on the market on 6 August 2016 through Smiths of Tamworth with an asking price of £425,000. This is a four-bedroom detached cottage with a garden of about one-third of an acre and overlooking open countryside. 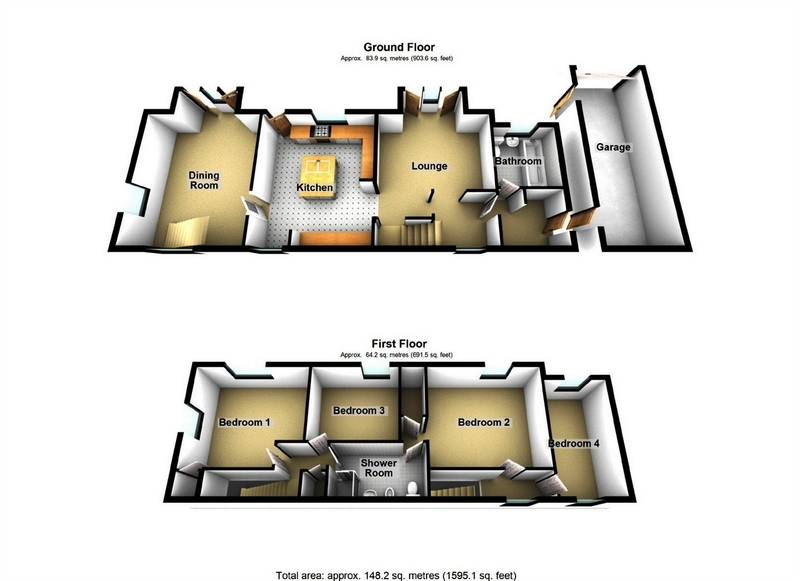 There are two reception rooms, a refitted kitchen, ground floor bathroom, first floor shower room and side garage. Lodge Cottage is built in brick beneath a pitch tiled roof and has a combination of a cream rough-cast rendering and tiled cladding to all elevations. It fronts directly onto the road, with the garden to the rear and rural views beyond. Lodge Cottage is a freehold property that was created from three original cottages built around 200 years ago. It stands on Manor Lane in an enviable position in the heart of this delightful village, beside Comberford church. This four-bedroomed detached cottage has a garden of almost one-third of an acre and overlooks open Staffordshire countryside. There are two fine reception rooms, a good-sized refitted kitchen, a ground-floor bathroom, a spacious first-floor shower room, and a side garage. The house is built of brick beneath a pitch-tiled roof and has a combination of a cream rough-cast rendering and tiled cladding to all elevations. It front s directly onto the road at Manor Lane, while to the rear is the garden of about one third of an acre with views of rural Staffordshire beyond. The access by two separate stairways from the ground floor to the four bedrooms upstairs shows how Lodge Cottage was put together from three older cottages. A stairway leads from the dining room to one of the first floor landings and two of the bedrooms. A second stairway from the lounge area leads to the right hand landing having window to roadway and off which lead two other bedrooms. Outside, to the side of the cottage, is a brick and tile garage. The garden of one third of an acre enjoys a high degree of privacy, with a small concrete flagged patio, a lawn, shrubs, flowers and trees. Beyond the rear boundary is open countryside as far as the eye can see. Immediately to the right of the garden is the village church. Comberford is within Lichfield District Council and the nearest train stations are Tamworth (2.2 miles) and Lichfield Trent Valley (3.8 miles). 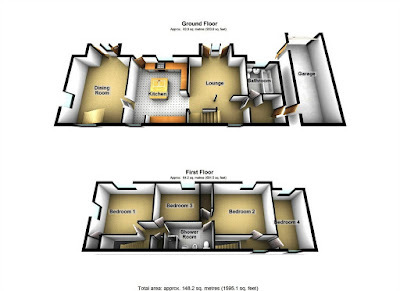 For more details about Lodge Cottage, Manor Lane, Comberford, Tamworth, Staffordshire B79 9BG, contact: Smiths Estate Agents, 5a Victoria Road, Tamworth, B79 7HL. In between the early 9 a.m. Said Eucharist in Saint Bartholomew’s Church and the Solemn Eucharist at 11 a.m., I have time to walk around the neighbouring streets and to appreciate the wonderful domestic architecture that has survived since the late Victorian and Edwardian decades. Many of the street names commemorate the Battle of Waterloo 200 years ago: Waterloo Road and Wellington Road are obvious. Elgin Road, Clyde Road and Elgin recall some of the generals or regiments in the battle. Few of the houses on Elgin Road, Clyde Road and Raglan Road are listed in standard architectural guides and directories. But they illustrate the elegant lifestyles and aesthetic expectations of the professional and middle classes of Dublin in the second half of the 19th century as they moved into the houses being built on the Pembroke Estate in Ballsbridge. Many of these houses, once built as single family units, have been converted in recent decades into embassies or embassy residences, and some are the offices of professional bodies. Some of these houses were converted into multiple bedsits and flats in the 1960s. But the vigilance of the Pembroke Estate in the past and the rise in property values in recent years combined to reverse this trend. However, at a time when escalating property prices have squeezed many ordinary families out of the housing market, it is startling to read how many former residential properties in this part of Dublin 4 remain unoccupied and empty as developers and speculators wait for property prices to rise even higher. Earlier this summer, the Central Statistics Office (CSO) published figures for the number of vacant dwelling in Dublin. They show there 6,300 vacant residential units, and surprisingly there is a high concentration of these in the affluent south-side areas. The electoral area of Pembroke West B stretches from the Dart station at Lansdowne Road to Morehampton Road and includes Elgin Road and Herbert Park. In this area alone, 365 of the 1,693 homes are vacant dwellings. The figures do not include holiday homes, derelict buildings and buildings being developed. But this still amounts to a vacancy rate of 21.6 per cent in this part of Dublin alone. The give-away signs include a house having no names on the electoral registry, no furniture to be seen through the windows, or piles of junk mail gathering at the front doors. On Elgin Road, a number of large buildings that once had been converted into multiple flats now lie vacant and empty. An example of this is the two adjoining houses at No 4 and No 6 Elgin Road, which have been on and off the market over the years. These two houses are surrounded by desirable red-brick Victorian houses. They are opposite the Belgian embassy, and a minute or two walking distance from the US, Israeli Egyptian, Turkish, Mexican, Kenyan and Ukrainian embassies. But, despite such a desirable location, they have lain empty for years, shielded by the leafy trees and long gardens that separate them from the footpath. Their façades and brickwork still look sturdy, but the grass is high grass, the weeds are pushing through, the paintwork on the doors and windows is cracked, and two large notices on the wrought-iron railings and gates warn passers-by not to trespass. These two houses have been on the market at least twice in the last few years, and Dublin City Council granted planning permission in 2002 to Elgin Properties Ltd to refurbish No 4, No 6 and No 8 Elgin Road. All three are protected structures, and the permission allowed the developers to convert them from 30 empty bedsits into nine luxury apartments. However, the work was never carried out, the planning permission lapsed, and the houses have continued to deteriorate. In 2011, Colliers International put the three three-storey, red brick houses up for sale along with their garden coach houses on Pembroke Lane. At the time, the three terraced houses were described as four-storey, spacious, early Victorian residences, with an estimated floor space of 418 square metres. But all three were in a poor state and had been vacant on-and-off for more than 30 years. A report in The Irish Times at the time said the estate agent was looking for €6 million, and they were being sold on behalf of the hotelier James Reynolds, a brother of former Taoiseach, the late Albert Reynolds. James Reynolds is also father of John Reynolds, the music promoter and organiser of the Electric Picnic. No 4 and No 6 were put back on the market again by Hunters Estate Agent, with the suggestion that one or both would make an ideal embassy. They were priced at €1.75 million and €2.5 million, but once again they did not sell and were taken off the market, although a sign for Hunter’s still stands in the front garden at No 4. Shortly before the houses were put on the market for the first time, it was revealed that No 6 was used as the address to obtain a false Irish passport for a man who was part of an Israeli hit squad that assassinated a Hamas official in Dubai. At least five fake Irish passports were used by the hit squad. They were issued before 2005, when new passports were introduced, containing biometric information. But as many as nine forged Irish passports using numbers from genuine Irish passports may have been used by the hit squad and their back-up team. The Irish Times saw a copy of an invoice issued by the Jumeirah Emirates Towers Hotel to a man using the name Kevin Daveron. The police in Dubai said he was one of up to 18 suspects in the killing of Mahmoud al Mabhouh in his hotel in 2010. The invoice gives Kevin Daveron’s address as 6 Elgin Road, Ballsbridge, which is less than 300 metres from the Israeli embassy. Speaking on behalf of his father, John Reynolds told The Irish Times that his family was “absolutely shocked and horrified” that the property had been used as an address by a member of the hit squad without their knowledge. Sam Smyth wrote in the Irish Independent 2010 that the suspected spy at the centre of the forged Irish passports scandal was well-known to ‘securicrats’ in Dublin. Sam Smyth’s report suggested that this could have been an Israeli revenge for the decision to provide Irish passports for Palestinians when rich Arabs loaned over £1 million to Albert Reynolds’s C&D pet food company in 1992. Needless to say, no-one has ever been extradited to face trial for the murder, or been charged with forging Irish passports.